Your excavator digging buckets need the right tooth systems to penetrate the material easily, to take the load off the bucket so they can work more efficiently and extend their useable life, and tooth systems that offer strength through the adaptor, easy changing of the tooth, great wear properties and maintain sharpness through to the end are most important to the success of your business. Whether you operate in mining, quarrying, building or any earth moving, you need Ground Engaging Tools (GET) that are reliable and easy to use, improve productivity and save you money. At eiengineering, we design and stock a range of tough ground engaging tools for the right attachments and for the right equipment and application. With high engineering standards our GET products are designed for correct fitment, wear and longevity, and that means reduced downtime and increased productivity for your job. They’re also designed for simple and easy installation so you can get on with your job. Our continuous R&D sets us apart as specialists in designing and developing tough, heat-treated high-strength and wear-resistant GET at market competitive rates. Tooth Styles – We stock heavy duty, high penetration, rock chisel, tiger and standard teeth. All stocked teeth are high-strength, heat-treated, durable and wear-resistant. Weld on Replacements – Apart from ripper boots, our adaptor replacements are available for shrouds and shank protection. We stock all major GET brands that live up to eiengineering’s stringent guidelines for toughness and durability. Staple brands include Hensley, Caterpillar, Esco and Keech among others. Our collection of teeth and adapters make optimal use of the excavator’s power, and bucket digging performance, increasing performance and efficiency and fuel consumption. eiengineering’s catalogue of Caterpillar teeth stocks General Purpose teeth and Twin Tiger & Rock Chisel for Rock and abrasive applications. Our stock of Caterpillar teeth start at the “J” series excavators. We carry a full range of Esco teeth and adapters for the construction and mining industries from “E” series to “Super V” series. We stock a wide range of Bolt On Edges / Cutting Edges to replace bucket edges for excavator Mud Buckets, Skidsteer or Wheel Loader buckets. Available in all types and sizes, our stock of reversible Bolt On Edges / Cutting Edges allows you to increase the returns on your investment. 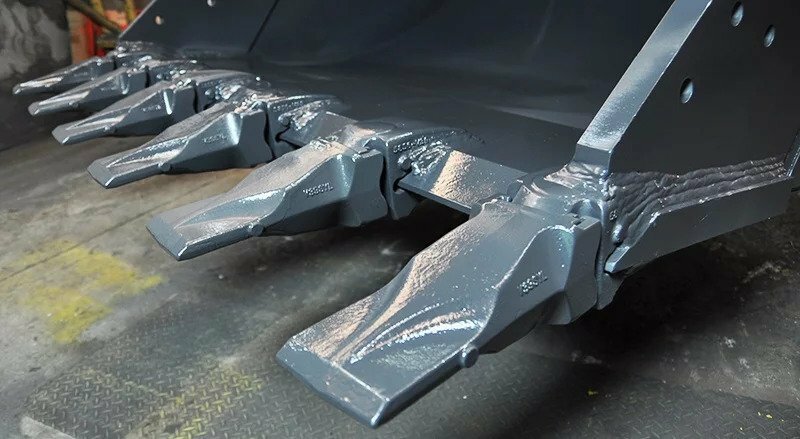 Side Cutters add additional protection to your excavator’s bucket from abrasion and extra clearance when required in particularly soft material.